Xu Shichang (Hsu Shih-chang), President of the Republic of China (1855-1939). No place, 14. VI. 1921. - 1 p. 155:211 mm. A rare bold black ink signature by Xu Shichang as President, in Chinese characters, to an oblong 4to page removed from an album. 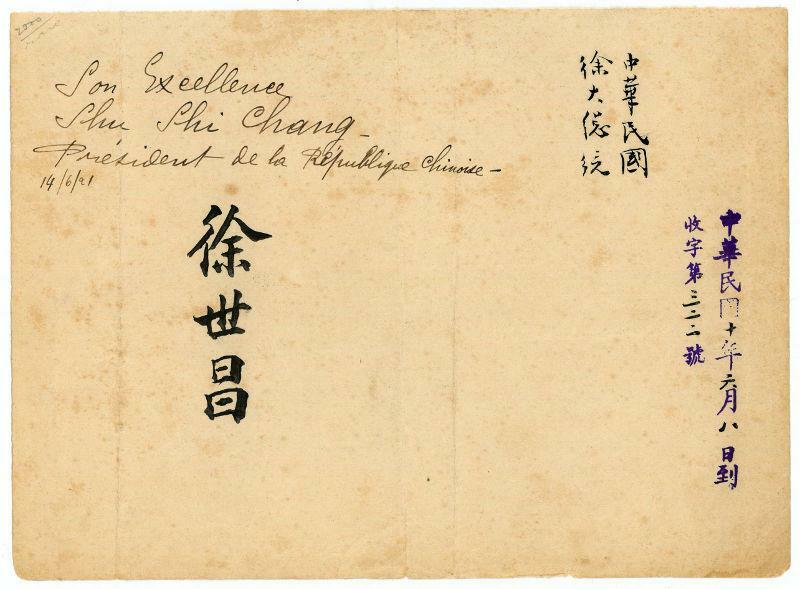 To the head, above the President s signature, and written in another hand, in French "His Excellence, Shu Shi Chang, President of the Republic of China, 14th June 1921". To the right border of the document, written in another hand, in Chinese characters, "President Chu, Republic of China", and "8th June, year 10". - The Republic of China was established in 1912, corresponding the year 10 of the Republic of China to 1921. - Overall age wear and light foxing, with small tear to the fold.